Small groups are honestly the backbone of my math instruction. Small group math instruction allows me to really meet the needs of all of the learners in my classroom. Together with whole class instruction and math centers, small groups help me ensure my students master the standards and skills in deeper levels. 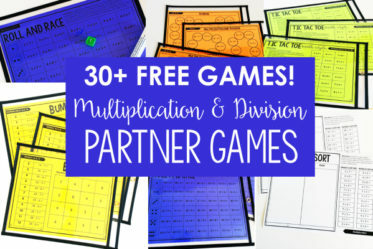 In this 4-part blog post series, I will share an in-depth look at what small groups in math look like in my classroom with resources and freebies to help make them work in your classroom. 1. Planning for Small Group Math Instruction – You are here! 2. Small Group Math Instruction Resources, Materials, and Activities <— Click to read. 3. Small Group Math Assessment and Data Tracking – <— Click to read. 4. Tips for Teaching Small Groups in Math – <— Click to read. There are a few things to take into consideration when forming your small groups. The main factor to consider is how you will group your students: homogeneously or heterogeneously. How you group your students will determine a lot of factors with your small group instruction and the materials and resources you use. For more information about forming your small groups for math and to grab the form shown above, click here. Giving a quick pre-assessment over a variety of skills…click here to read more about this and download FREE pre-assessments for grades 3-5. 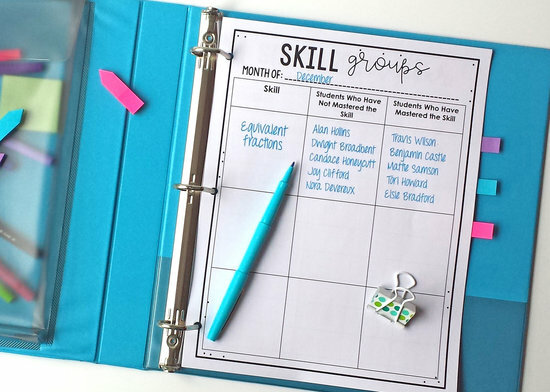 I keep my planning pretty simple, but I do like to do a variety of weekly, monthly, and yearly planning so I can really maximize the instruction time. Let’s take a look at some of the different forms I use. For this form, I like to map out my entire year. The skills I put on this form are from my whole group instructions based on my math pacing guide. 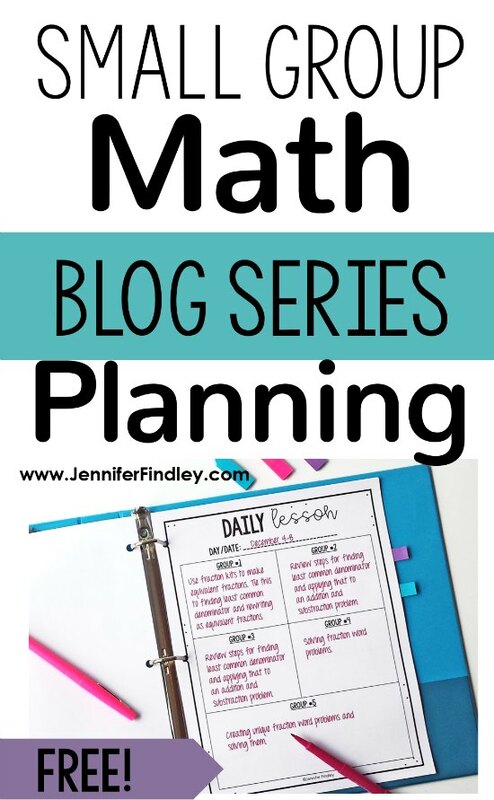 You can read more about my 5th grade math pacing guide and download it for free by clicking here. For this form, I like to plan out the math skills and concepts I want to hit hard in small group math during the month. Of course, this is subject to change based on my students’ mastery and understanding, but having the guide is super helpful. 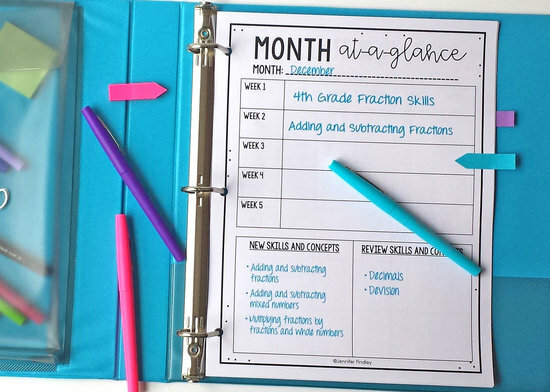 I also record the new skills I am teaching that month in whole group and the review skills that I need to spiral back through small group or math centers. I also like to keep track of my standards that I have taught for each group. 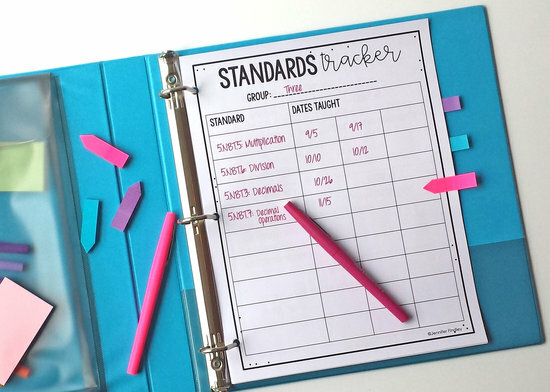 This helps me make sure I am spiraling the key standards as much as I can. Read more about how I spiral review in other ways and with other subjects by clicking here. Most of the forms I have shared work better for planning small group math during guided math centers. However, I also pull small groups during whole group instruction days (remember that I only do guided math center instruction 2-3 times a week). For those groups, I pull based on skills. I use the form shown above or forms from my Exit Slip Analysis Binder, which you can read about by clicking here. And finally, I like to plan out my math centers for each month. 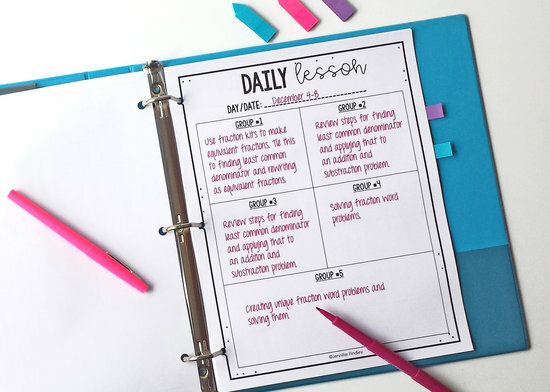 This form is super simple, and I usually just write the skill under each week that I want to target that week in math centers. My math center skills are always review skills or extensions of a whole group activity or small group activity that we have started together. 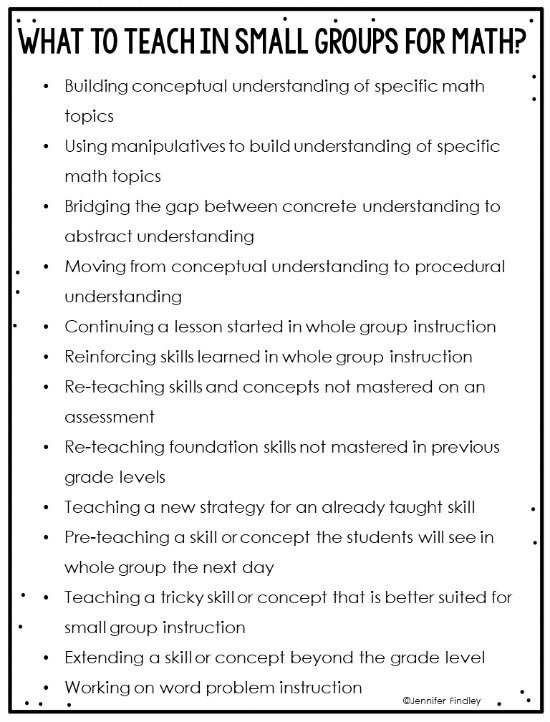 Where Can I Get These Small Group Math Instruction Forms? 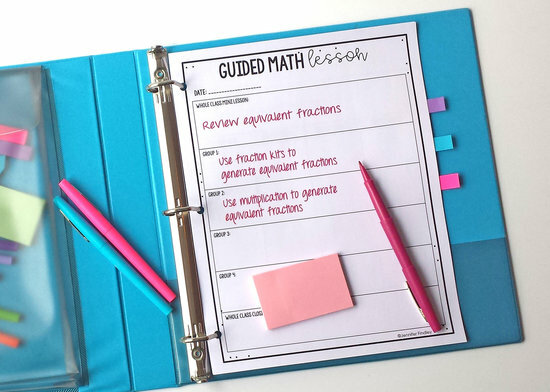 Click here to download the planning forms for your guided math small group instruction (the ones shown and other versions for more days). 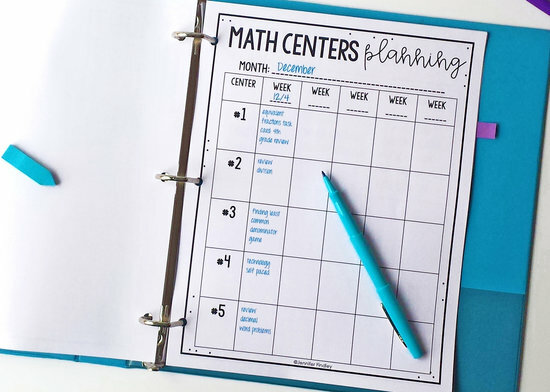 Want to read more about math centers? Click on any of the links below to check out more helpful articles. Wow! Such a helpful resource. Thanks for providing so many awesome freebies as well! Any chance you’ll be adding more third grade materials soon? Your blog is amazing! Your resources are amazing! I am going to read all of your posts on small group math. Two years ago I started workshop 1/2 way through the year. Last year I used it most of the year up until we hit testing and my last few units. I know I can never go back to whole group, but am looking to get better at my workshop organization. I am teaching 6th grade and I want to do small group/centers rather than whole group. How do I transition from one to the other? Thank you!! I’m teaching 6th grade and I implemented centers this year. Your resources are great and I love your blog. Thanks for sharing your wealth of knowledge and experience with us. 5th not 6th. Slip of the fingers. Thanks for sharing so much with us. I look to your blog for ideas and help. How do you find the time to do this and teach? I appreciate you! You’re so welcome! And I’ve been teaching part-time for the past two years, so that has helped greatly! Would you happen to have any resources that target high school math classes? I teach 4th grade and I am in love with your resources. I just purchased your exit slips and this dovetails perfectly. I can’t wait for school to be back in session so I can start using these! Thank you! I am so glad my resources are helpful!